The 2019 participation fee is $475. 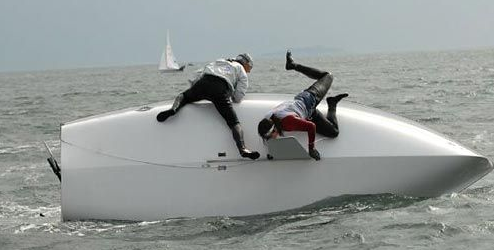 While insanely fun, sailing is an expensive sport. However, considering the number of sailing days and comparing to summer programs this is actually a great bargain...and you don't even need to own a boat. The board is committed to not let this fee be the limiting factor for any student. If the cost is a hardship for your family, please reach out to the president or treasurer either directly or through the coach so that we may find a solution. In addition, there is a suggested donation to the capital fund of $150 to ensure the sustainability of Avenger Sailing for years to come. We've learned over the years that many fundraisers end up right back on the parents in the end, so this was the most efficient way to raise capital funds. The team will have additional fundraising activities, however we try very hard to avoid hitting you again. There are 2 ways to register for Avenger Sailing. We prefer you pay by check because it saves us credit card and PayPal processing fees. There are 3 mandatory forms that need to be submitted. We cannot allow a student out on the water until these are received. Please read the required equipment list carefully and don't hesitate to ask questions. Below are the forms that MUST be completed prior to being able to participate. Please Note! payment must be received prior to being able to participate in team activities. Please review the required equipment that your student must have in order to participate. It is very important to adhere to the requirements as the water is extremely cold during the season and capsizes do occur.